West Bend Water Utility chose a 20' Ford F59 stripped chassis for their mobile equipment truck. Inside, a station for charging flashlights, 4 hard hat hook racks for simple storage, and custom fabricated aluminum storage have been included. A custom fabricated console has been installed above the windshield to house electrical distribution components and control panels. The interior also features a galley kitchen with microwave and coffee maker, a thirty gallon translucent fresh water tank, and a mounted cord reel to allow for use of hose pass through. On the outside an Onan 120 volt AC generator has been mounted in a custom fabricated all aluminum compartment. 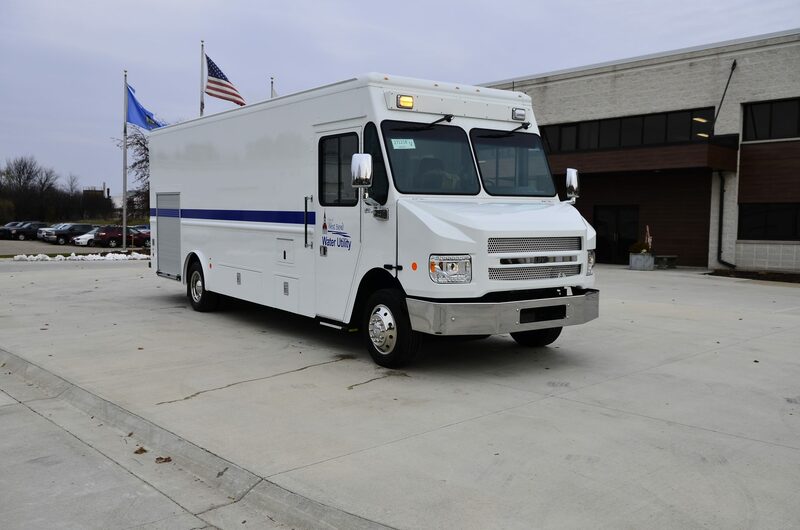 Dual telescoping tripod LED light poles, multiple exterior storage compartments, emergency lighting, and a dedicated compartment for the hose pass through with a locking aluminum door have also been added to the exterior of West Bend's mobile equipment truck.